Meet motusbank! Launching for Canadians this spring, motusbank is a full-service digital bank. Check out the motusbank website for more info, and follow their social media profiles for news, exclusive offers, and to ask questions. "9. What is the functional and operational relationship between Meridian and motusbank? Meridian is the parent company to motusbank. The bank will be a separate legal entity operating independently and will have its own unique member base and banking system. What does "aligned" mean? If they meant "the same", surely they would have said so. the lack of bricks and mortar to maintain should mean better rates than Meridian, but will it? It would be hard not to do better than most of the current rates at Meridian. It's not a very good choice of name IMO, as it sounds too much like Motive, but I'm sure I'll get used to it. I would have preferred Modus if they had to go that way. I also think their decision to call all clients "members" is confusing since Modusbank users will not have voting rights with Meridian. Initial marketing strategy is going to be mortgages, so it's clear their priority is a younger audience, not seniors. Not surprising, but not encouraging either. On the positive, it will give us another 100K in insurance coverage, through CDIC, in addition to the coverage at MeridianCU through DICO. #.9 Like Bugs Bunny says......."That's all, folks!" With all the hype there is not much confidence in being a leader in rates. Time to drain money from Simplii and Tangerine for 6 months, when Motusbank launches. We will have some 6 month introductory specials probably 0.5% better rate than Tangerine and Simplli. So if Tangerine has 3% lottery rate, these guys might give 3.5% for 6 months for transfers. Are we, "rfdm4g4g9", a representative of Motusbank or Meridian authorized to make such statements? 9. says it all. Some hype for a few months and then back to ho hum Meridian rates? Why are you so negative about rfdm4g4g9, who has belonged to this forum for 2 1/2 years and has never given any reason to think he/she speaks for Meridian? It's common practice for new FIs to offer rate specials lasting 3 to 6 months, and it's reasonable to assume this one will also do something along those lines. The fact that they appear to be starting with mortgage rates is unusual. A previous blurb from Meridian, several months back, suggested that, in general, rates would be the same at both Meridian and the new bank, but logic seems to suggest they might be slightly higher at motusbank, with no branches to maintain. Because he/she appears to be speaking as a representative of Meridian. Perhaps I have misunderstood? Or he/she is assuming too much. Please re-read his/her notes. I did not intend to offend but wanted to clarify where he/she was coming from. He/she was just saying what anyone would likely say who has been watching this forum over a period of time, as I explained before. Where he/she is coming from is experience. Reps are usually fairly easy to identify, and they are normally new members who join specifically to promote or clarify something in particular. Many will identify themselves. We need a separate heading for Motusbank, just like we have for other banks like Tangerine and Simplii Financial. I vote for that, too. With the expectation Motusbank will position itself as a bank (CDIC insured) and with promo rates, it would be nice to have them tracked separately on this site. rfdm4g4g9 said Time to drain money from Simplii and Tangerine for 6 months, when Motusbank launches. Unless Simplii, Tang or Motive offer a comparable deal for these first 6 months of Motusbank promo rates. They could. If not, my Tang 3% Savings account promo expires mid-may, just in time for Motusbank to get my money if they offer 3% interest. Couldn't have been more clearer ... we, as in we the investors ... jumped out immediately to me. My final words on Motus bank. They won’t make a difference or be a leader. According to their rates here, they are the bottom of the barrel. Some VP had a flash that said let’s get online to expand our business and we sell service but not be competitive rate wise. And the VP likely said we, Motus, don’t want to lose our core customers as they will be disappointed to see we offer higher rates online. So Motus will be insured under CDIC for $100k and separate from Meridian CU which is $250k insured ? Correct. They're separate entities, and Motus Bank will have to hold separate capital as regulated by OSFI, which is part of the reason why I'm puzzled Meridian went this route rather than reincorporating as a federal credit union. This route likely adds some significant costs versus the other option. I realize they probably want to maintain the $250,000 per depositor DICO deposit insurance, but Coast estimated less than 4% of its customers held more than $100,000 per unique depositor and account type (RRSP, non-registered, etc. ), so I think they could've converted with an immaterial loss in business. Any idea what happened to those Coast customer who has over $100k and in fixed term deposit (GIC) when they changed from CU to bank ? Would they now have uninsured deposit for the amount above $100k ? From CC Statement of transitional coverage"
Any eligible pre-existing demand deposit, less any withdrawals made during the transition period, will have this coverage until April 30, 2019. Any eligible pre-existing term deposits, will have this coverage until it's date of maturity or cashing out." 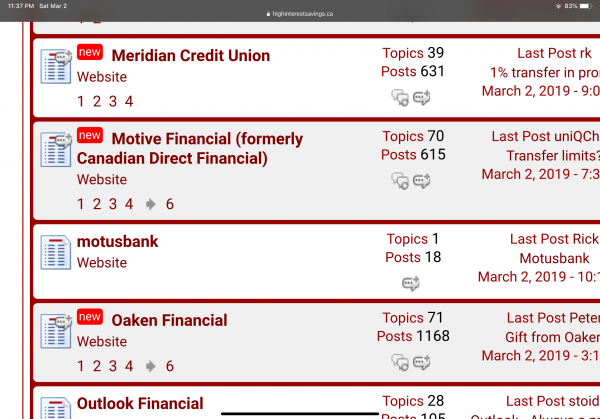 Motusbank only gets a lowercase “m” in the Discussion forum? Correct. That's how THEY spell their name.